Chemesthesis are the chemically initiated sensations that occur via the touch system. Examples in the mouth include the burn of capsaicinoids in chilies, the cooling of menthol in peppermint, and the tingle of carbonation. It is physiologically distinct from taste and smell, but is increasingly understood to be just as important as these senses for their contribution to flavor, especially with the sustained growth in interest in spicy foods from around the world. 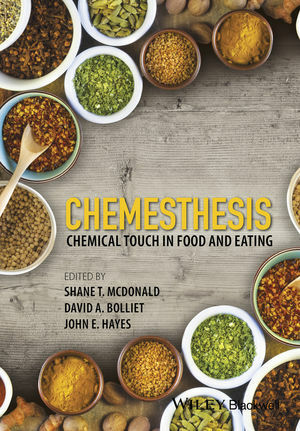 Chemesthesis: Chemical Touch in Food and Eating surveys the modern body of work on chemesthesis, with a variety of contributors who are well known for their expertise on the topic. After a forward by John Prescott and an introduction by Barry Green (who originally coined the term chemesthesis 25 years ago), the book moves on to survey chemesthetic spices and address the psychology and physiology of chemesthesis; practical sensory and instrumental analysis; the interaction of chemesthesis with other chemical senses; health ramifications; and the application of chemesthesis in food. The major types of chemesthesis, including pungency/burning, cooling, tingling, nasal irritation, and numbing, are each covered in their own chapter. The book concludes with a look to the future. This is the first comprehensive book on chemesthesis since 1990, when Barry Green and his colleagues edited a volume on the perception of chemical irritants, including those in food. This new book is intended to be a vital resource for anyone interested in the sensory impact of the food we eat, including food scientists, sensory professionals, analytical chemists, physiologists, culinary scientists, and others. David A. Bolliet, Kalsec Inc., Kalamazoo, MI, USA. Dr John E. Hayes, Department of Food Science, The Pennsylvania State University, University Park, PA, USA.